Millions of workers go to work every day for a company that isn’t actually their employer. The firm that sets their wages and schedules, and determines their benefits and how long their job lasts, isn’t the boss that actually cuts their paychecks. They are technically hired via a temp agency, a subcontractor, or another obscure “staffing agency” that supplies the worksite—like an Amazon warehouse or a school cafeteria—with auxiliary staff. The Trump administration is now quietly making it easier for companies to exploit these subcontracted and outsourced workers. Under pending reforms planned by the Labor Department and National Labor Relations Board (NLRB), this legal end run around fair-labor standards could be further narrowed, making it harder for workers to, for example, organize workers at a warehouse operating under several different contractors, or stand on a picket line together. The Obama-era NLRB revamped the standard to better fit today’s complex workplaces, so that a company might be considered a joint employer if it generally controlled working conditions based on a “common-law” definition, so that the two employers “share or codetermine those matters governing the essential terms and conditions of employment.” This broader joint-employer standard boosted the Fight for 15 campaign’s legal standing, when workers filed a claim of unfair labor practices against McDonald’s at the NLRB in order to hold it accountable as a joint-employer. Were the Obama-era standard—established in the landmark case involving workers at Browning-Ferris Industries—to be applied to the fast-food industry, the mega-chains that lord over hundreds of thousands of workers nationwide could be held liable for basic labor protections at franchise locations. Potentially, joint-employer status would enable all food-prep technicians, cashiers, and custodians nationwide to organize to collectively bargain labor contracts. The Trump administration’s Labor Department and the Republican-dominated NLRB seeks to revise, and potentially gut, this standard. Since both bodies have been actively dismantling labor protections, ranging from occupational safety to pensions, joint-employer rollbacks could set back the past several years of incremental progress toward workplace equity in many low-wage sectors. After contentious litigation in a separate case know as Hy-Brand (in which the initial ruling was blocked by an ethics conflict) the board plans to revamp the joint-employer rule. The new proposal, currently in the public-comment period, would define joint-employer so that the company would have to “possess and actually exercise substantial direct and immediate control” over the workers’ jobs. In the increasingly multi-contracted, fissured world of work, it will be harder to hold the companies accountable for wage, discrimination, and labor violations…. Except in unique circumstances, workers will be left to struggle with only the nearest link in the contracting chain when larger, richer companies will be just as responsible. Those larger, equally culpable companies will be off the hook. If the NLRB fully overturns the Obama administration’s definition, one of the Fight for 15’s core demands—the right to form a union—could be quashed. Before Trump’s election, labor advocates had hoped that a successful challenge to McDonald’s at the NLRB would finally get labor regulators to treat the company like what it actually is. The company is not a mere brand or a detached network of “small-business owners,” worker advocates argue, but a massive, global fast-food company; the degree of control McDonald’s exerts as a brand is evident from the uniform menus, uniform mechanized burger-making system, and uniformly abysmal wages. 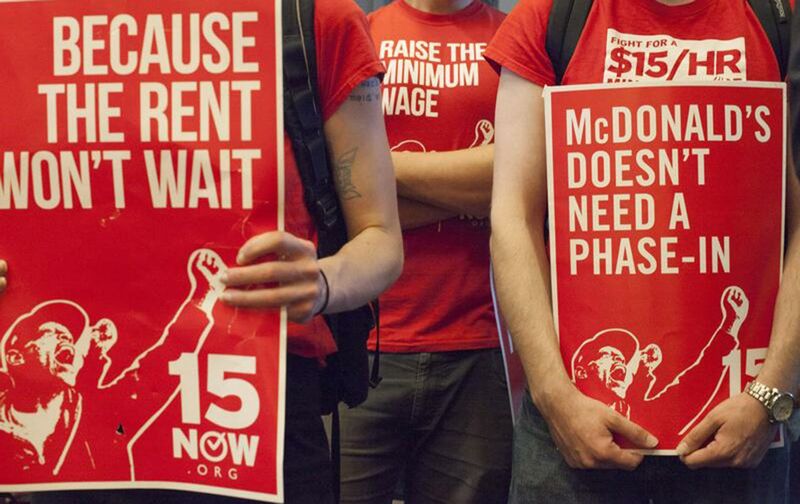 So McDonald’s demands the right to profit from its closely guarded global restaurant monopoly, but lashed back when Fight for $15 workers began launching wildcat strikes and demanding that the company follow standard labor laws for the more than 230,000 US workers it controls. As Moshe Marvit wrote in In These Times, the standard could factor into your ability to picket a bad boss alongside coworkers, pointing to a related NLRB ruling that effectively curtailed the rights of subcontracted janitorial workers to engage in a “solidarity strike” at their worksite. Such a restrictive reading of the law, Marvit argues, “will make it more difficult or even impossible for many workers to have any meaningful voice in the workplace,” not least because employment law already severely restricts workers from engaging in organizing and other political action at work.